A hot tub situated outdoors gets exposed to various elements that can affect its components and eventually cause premature wear and tear. Environmental factors such as UV-rays, rain, snow, mildew, insect or animal droppings and harmful chemicals are some of the things to watch out for when you own a spa at home. Regular cleaning may help keep your tubs looking shiny and new but the kind of protection that hot tub covers provide is invaluable. Putting in the right cover for your spa can shield it from potential pollutants and the effects of an ever changing weather. You can also save up on your water and electric bills by keeping water clean and warm while your children and pets run around. Preserve your hot tub and safeguard your family by investing in a good spa cover. There are a number retailers that carry different brands that offer quality, simple or high-grade covers. To know which one to buy, it is best that you visit various websites that post product descriptions and consumer hot tub cover reviews. 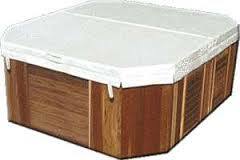 Learn and compare different hot tub cover models and avoid wasting your money and time on poorly made hot tub accessories that are wrong for your tub. Find out the best stores and online sellers that carry the spa covers that are right for you. Shopping for a hot tub cover can be very tedious and difficult when you do not know what to look for. There are measurements, color, material, texture, warranty, cost and a bunch of other characteristics to consider. While brands and companies all seem to boast about making the ‘best hot tub cover’ in the market, educating yourself and careful preparation will help you go a long way. Make sure that you get precise measurements from your hot tub. You can either take manual measurements or you can simply check for product specifications online. If you look carefully, some articles may even already share suggestions for spa covers and hot tub accessories that are perfect fit for your existing tub. Learn about foam thickness, density, measurements in millimeters and other qualities that do not normally interest you. Write down key attributes that you look for in hot tub covers and arrange them based on the most important to what you think is the least important attribute. Foam thickness, the kind of material used, warranty, energy savings and cost are some of the things to reflect on while you do your research. For example, putting ‘cost’ at the top of your list is easy when you are really after cheap hot tub covers. 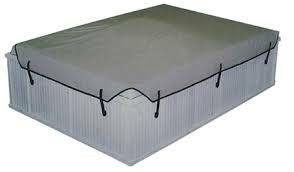 There are stores that carry used hot tub covers if you are determined to save. Ask around or do an online search to help you locate stores that sell them. You might just be able to hit jackpot on one that was barely used or one that needs a few minor repairs. Read and watch product reviews that showcase hot tub covers that have undergone some form of testing. This may be a good way to find covers made from heavy-duty materials that can withstand tough weather conditions. Do not be afraid to spend a little more on a spa cover. Yes, you do not plan to go over your budget so you convince yourself that products are all the same without realizing that spending just a few extra bucks can get you more years in warranty and promote higher energy savings. A pros and cons list might come in handy. Find the one that provides good insulation to increase the time it takes for water to cool down and help you save up on energy costs. Look at both soft and hard hot tub spa covers. They may just be covers for your tub but style and design still matter. Check for stores or brands that offer discounts on a new or used spa cover lifter. You might just find one that provides a good deal on a hot tub cover – cover lift package. The above list contains some tips to guide you. Feel free to create your own set of pointers, perhaps to add a few new suggestions or to completely overhaul the list. Go ask your friends too for their expert advice. In any case, what is important is that you make a plan and put some thought into your purchase so you do not end up replacing your spa covers and spending on a new one all the time. Hard or Soft Spa Covers? Both hard and soft hot tub covers are placed on top of a hot tub to keep the insides clean and to help retain water temperature, but these two variations also have its unique set of features. Soft spa covers are made out of light materials that allow for ease in opening, folding and closing. Its lightweight properties make it easy to lift it up so you can have your spa ready in no time for unexpected requests from friends or close it right away when you are in a rush to finish. When your hot tub is situated indoors with a roof over it, you can use the soft type if you need spa hot tub covers to just keep light debris and dust out of the way. For outdoor spa models, soft spa covers may also be an effective protection against rain, sunlight and snow but take note that some types may not be made to last especially when subjected to tough elements and environmental factors. Hard hot tub covers, on the other hand weigh more and tend to require a little bit of effort to handle. However, it is the perfect choice when you require a top that can carry heavy weight and can withstand people sitting and stepping on it. Since they are thicker, they can provide better insulation and may also hold out against harsh weather conditions. For jet setters and those who are constantly traveling, this can help provide peace of mind. While it may be easy to go for the hard spa cover with all its advantages, take note that this type can also cost a lot more than its soft counterpart. Also consider purchasing hot tub cover lifters to assist you with lifting and closing. A spa cover lift is both a convenient and safety tool especially if you own a heavy cover. This entry was posted in hot tub parts, leisure bay spas and tagged hot tub parts. Bookmark the permalink.